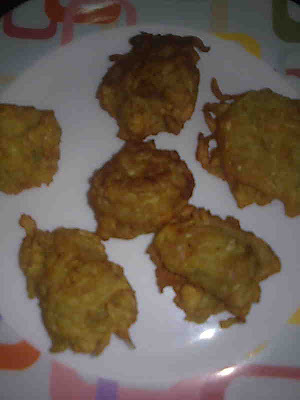 Rice pakora or chawal ke pakode makes tasty evening snack and can be made really fast if you have cooked rice on hand. You can use leftover rice for making rice pakora. 1. Take besan in a bowl and add all the ingredients except oil. Add 1/4 cup water to make thick batter. 2. Heat oil in a kadhai/wok or deep frying pan. When the oil is hot enough, turn the heat to medium. Drop small portions of the batter in the kadhai. 3. Deep fry rice pakora till golden, turning as needed. Drain pakode on an absorbent paper. Fry in batches. 4. Serve rice pakora hot with chutney or tomato sauce.